It is finally Fall, so I thought it would be fun to round up my favorite fall items! 1. An oversized sweater is ALWAYS a good idea. You can throw it on with leggings, boots, and a scarf and be good to go. I think it would also be cute with tennis shoes too! This sweater comes in 6 colors and is under $30! You can shop it here. 2. Open toe booties are the perfect fall shoe! They are right on trend and so so cute! There are lots of options for them out there, but these are my favorites! They are under $35 and you can shop them here. 3. Olive green utility jackets go with everything! It is the perfect fall jacket! This one I found is $40 and you can shop it here. 4. Okay...these booties are my favorites! I love the cut out detail!! They are Jeffery Campbell look a likes (which I am dying to have) and come in three colors. You can shop it here. 5. Capes were in style last year, and I am so happy they still are! They are so comfy and an easy way to make an outfit super cute! You can wear this over sweaters, t-shirts, or a dress! I love the colorblock on this one! It is $35 and you can shop it here. 6. Is your fall wardrobe even complete without plaid shirts?! I know mine isn't! The colors in this one are so pretty and different! It is currently on sale for $22 and there are more colors! Shop it here. 7. A neutral tote is a fall go-to! The tassels on this one won me over. This one comes in 5 colors and is under $50. Shop it here. 8. A fur vest is for sure a fall must have! This white one has me in love. It is so perfect and only $40! Shop it here. 9. One of my favorite fall trends....bell sleeves! I see them everywhere and they are all so cute and girly! This dress has bell sleeves and the prettiest floral print. This one comes in 6 different color options and you can shop it here. 10. Scarves are the absolute best fall accessory! You can style and wear them so many different ways. This neutral colorblock one will go with everything! It is $25 and you can shop it here. 11. I came across this felt baseball hat and knew I had to have it right away. Shortly after that I saw everyone wearing it and the color I wanted was sold out. But it does come in camel and black and is under $20! Shop it here. 12. How honest is this shirt?? My life summed up in one sweatshirt! I loved it so much I just had to share it with yall. You can shop it here. I hope yall are having a great week so far! Fall break is in two weeks and I am so ready for it. It also feels like fall today and I really want to bundle up in a sweater and leggings and burn my new Bath and Body works candle all day! Whoah.....white after Labor Day?....YES, A MILLION TIMES, YES. The fashion faux pas of white after labor day is gone. It's fall, so bring out your white pants all you want, ladies! I probably wear white jeans 3X a week no matter what the season. White is a great neutral color to pair with anything! I especially like pairing it with dark tops in the fall and winter months. Okay, now it's time to talk about this new fall trend I am currently obsessing over. Sleeveless turtlenecks!!! 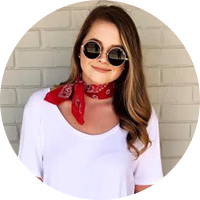 I have seen tons of other fashion bloggers pull off this trend lately and I was skeptical at first. It seems kind of intimidating so I thought I would never be able to wear it in a million years. But, I had to try it! I found this one at Target and I loved it ever since I put it on! It's so easy to style and very comfortable too! This exact one comes in 3 colors (I am going to get the burgundy one too) and is only $25! This is a great price for the amazing quality of this sweater! Happy Tuesday :) I got spoiled to the fall weather a couple of weeks ago, and it seems like it's never going to come back!! It has been so hot in Tennessee and I'm over here trying to wear boots and sweaters every day haha! Fall is by far my favorite season! This dress is AMAZING!!! My favorite dress for fall so far. I cannot get over the material and how comfortable it is! It feels like a huge sweatshirt but it's actually really cute and flattering. It also has pockets - and we all know we love dresses with pockets haha! This floral print is perfect for fall and I am obsessed with all things blush. It has a vintage feel to it which I love. I also just got this crossbody purse this past weekend. I love the gold buckles on the grey background! I can already tell grey is going to be my fall color. Also, who else wears top-knots when you don't feel like washing your hair?? Cause I do all the time haha! Happy Tuesday, yall!! I am off today and going to see John before he's gone for two weeks. Hopefully it will also feel like a mini weekend and the rest of the week will go by fast!! 1 Thessalonians 5:16-18 - Rejoice evermore. Pray without ceasing. In every thing give thanks: for this is the will of God in Christ Jesus concerning you. I love love love this top for fall! 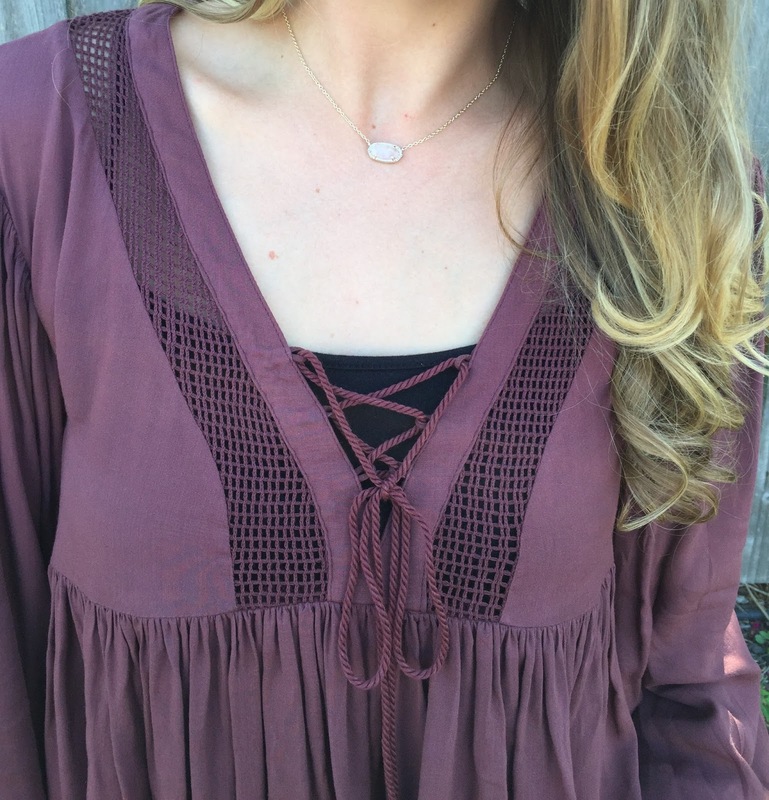 It is the perfect fall purple color and has the cutest detailing on the front. Not to mention it is super flowy and so comfortable! This top could also be paired with white denim or shorts with booties. I went with my new Articles of Society denim and the famous Sam Edelman lace-up sandals! My top is from The Chocolate Bunny Boutique in Union City, TN and I got my jeans from Flirty Birds Boutique in Dyersburg, TN! The jeans I linked below are my exact ones and possibly my new favorite brand! I would size down one size. Happy Tuesday, yall! I hope everyone had a great LBW! Are yall excited for fall like I am?? We had a few days of cooler weather this past week and I loved every minute of it! Fall is definitely my favorite season.